Canon Announces the G1X -- a More Powerful Fixed Lens Camera - B&H Photo is excited to share with photo enthusiasts the release of the latest exciting G-Series camera from Canon—the G1X— which features a host of updates and improvements for shooting stills and video that will enthuse serious amateurs alike. 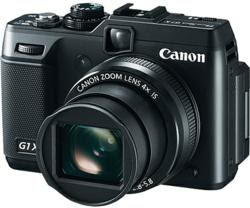 B&H Photo is excited to share with photo enthusiasts the release of the latest Canon G1X Fixed Lens Camera. The new Canon G1X replaces the PowerShot G12, and offers improvements and advanced technologies that make this camera behave like it’s much larger than it really is. The compact G1 X is armed with a new 1.5-inch High Sensitivity CMOS sensor, which is larger than a 4/3" sensor, and nearly as big as the APS-C-sized sensors found in professional DSLRs. This gives one a light-sensitive area which is nearly 6.3 times larger than the last generation of G-Series digital cameras, and delivers a quality level that’s unheard of in a compact, pocket-friendly camera. The shooting and photo effects in the G1X stretch the photographer's creativity. A brief sampling of modes includes: Custom, Portrait, Landscape, Sports, Handheld Night Scene, Program (and all his friends: Shutter-Priority, Aperture-Priority, the aforementioned manual, etc. ), Super Vivid, Nostalgic, Toy Camera Effect, Monochrome, Poster Effect, and then some. Another interesting feature is the Movie Digest which allows one to create a video of highlights from a day of shooting. When Movie Digest is on the camera will automatically record a short video clip (up to 4 seconds) every time one shoots a still image. The entire day's worth of clips will be automatically combined into a single video. Of course, the High Dynamic Range shooting mode takes a number of shots to ensure one will get a photo that works - one underexposed, one overexposed, and one normal. All three are combined for an image that is balanced and evenly detailed with flattering shadows and highlights. The lens on the G1X was designed to take full-advantage of its oversized 14.3 Megapixel sensor. And a powerful DIGIC 5 Image Processor has been employed to improve noise reduction, allowing this little camera to achieve an ISO up to 12800, ultimately enabling one to photograph in low light with less blur and shorter exposure times. The f/2.8 lens has 4x optical zoom, which utilizes Canon’s UA Lens technology to suppress aberration throughout the zoom range. With a 35mm equivalent focal length of 28-112mm, this lens will capture any scene, from portraiture to landscapes. Whether one has been photographing for years and desire a compact camera that doesn’t compromise on image quality and features, or a beginner who needs an excellent camera that can be used immediately, the new Canon PowerShot G1 X is a formidable and exciting new option. There’s a lot more to dig into on this camera: full 1080p HD video with a dedicated movie button and stereo sound, an optical viewfinder, a variable-angle 922,000 dot 3-inch LCD screen, 14-bit RAW shooting, HDR, tracking auto focus—and a heck of a lot more. The latest-generation Canon DIGIC 5 Image Processor brings phenomenal increases in processing speed and power. Improved chip architecture and algorithms deliver greatly expanded functionality with further refinement in image quality. Improved noise reduction produces clearer images when shooting in low light at high ISO speeds. Enhanced i-Contrast performance adjusts differences between light and dark areas to achieve even more natural-looking results. The faster processing speed also results in faster continuous shooting capability. The DIGIC 5 Image Processor also makes possible a highly advanced automatic white balance system. Whereas conventional white balance makes an overall adjustment based on a single type of light source, the Canon Multi-Area White Balance analyzes several areas of the image to determine whether different adjustments are needed, for example, for the main subject and the background. Shop Canon Digital Cameras for LE$$ / Price list Click here!